Raw Garlic: Health Food Or Toxin? , is often lauded for possessing disease-fighting properties, although these are not well established. For instance, a number of small animal-based studies initially seemed to indicate that garlic could fight the build up of the arterial plaque that's the source of atherosclerosis (1), but larger-scale human studies have shown no improvement (2). One area where garlic is proving quite effective is in its ability to kill bacteria. Long concerned about the growing resistance of bacteria to antibiotics, researchers have sought out other options, and garlic shows significant ability to kill living cells of many types (3). The source of garlic's antibacterial properties is allicin, which is also responsible for its pungent taste and odor. When someone complains about your garlic breath, or the the nasty aroma exuded from your pores following a garlic-rich meal, you can blame the allicin. Allicin is produced by garlic to defend against pests and predators interested in a quick meal (4), IE, hungry humans. Much like thorn-protected flowers, the idea is to cause as much damage as possible to any possible predator in the hopes that the animal will think twice before chowing down. The substance is very effective in what it does. I've used garlic extract to kill ticks that are attached to a dog. After about 30 minutes of being washed with 10 drops of pure garlic extract, the tick is dead. Organic gardeners have long known that many pests will think twice before crossing a garlic plant, and I've effectively used rows of them to protect my tomato plants, which are often the target of hungry bugs. Humans are significantly larger than insects and it would take very large quantities of allicin to kill us, if it's possible at all. None the less, there's significant reason to believe that raw garlic can harm us. You've probably seen the ridiculous drug commercials on television that promise to get rid of the side effects of your disease, but then note the laundry list of more side effects which people taking the medication may suffer from. Often the medication sounds worse than the initial disease. Raw garlic intake is notable because it has a similarly-long list of side effects, and almost seems like it's a drug. "Garlick maketh a man wynke, drynke, and stynke." Although it's harder to say what's happening out of sight in the body's interior, it's very obvious that garlic irritates the skin. As a rubefacient, garlic oil quickly causes the skin to redden when applied directly. Redness indicates that inflammation is occurring, the body's attempt to isolate a harmful substance so that it does not enter the blood stream and cause more problems. 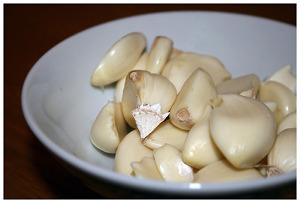 In some cases, when people try to regularly apply garlic to the skin as a acne treatment or for other purposes, serious burns have occurred (5). If garlic can damage our comparatively strong skin, what will it do to our delicate insides? Several studies have pointed out intestinal cell damage possibly resulting from garlic ingestion (6). 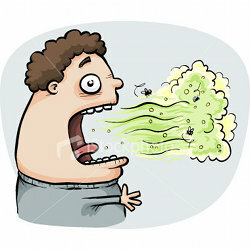 It's also been known to cause indigestion, nausea, vomiting, and diarrhea (7). 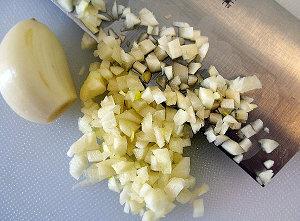 Garlic is a blood thinner (8), much like two popular poisons (all drugs are technically poisons), alchohol and aspirin. Blood thinners are promoted by medical professionals as way of cutting your chance of a heart attacks and strokes if you have heart disease. Unfortunatly, subseqently stopping this medication often causes strokes (9), especially in the case of aspirin. A far safer way to prevent heart attack and strokes is to get rid of the underlying cause- the powerful blood-clotting substances that people eat every day -meat, dairy, eggs, and processed oils and fats (10, 11). When you avoid meat and other fatty foods your blood is "thinned" naturally, which prevents hearts attacks and strokes with no side effects or rebound effects. The big difference is that blood thinning medication is a slap-dash fix that leaves you at risk when you stop, but a low-fat diet heals the underlying disease, athersclerosis, by removing the cause. Garlic's blood-thinning properties causes other problems. Because garlic inpairs the body's ability to clot blood and stop bleeding, it's reccomended that patients take no garlic for seven days prior to surgery to reduce the risk of heavy bleeding, and that women should not take it prior to giving birth (12). Think about that for a second - garlic actually impairs the body's ability to heal. You know a food is bad when it's believed to play a roll in accidental abortions, but garlic has been placed in that category (13), and its reccomended that pregant women stop taking it. Allicin, which, you'll recall, is strong enough to drive off or kill small bugs, enters the breast milk of pregnant women, altering the smell of the milk and the suckling behavior of the infant (13). It's a bit like topping off a baby's bottle with an insecticide. You wouldn't want to drink it either. Raw Garlic: Irritation You Can't Afford. Sure, raw garlic works like an antibiotic, killing bacteria. But is that a good thing? Think about what we've learned above. Raw garlic causes irritation to the skin, stops the coagulation of blood, induces nausea and other side effects, and can even cause abortion in some cases. Maybe a food that destroys life on the small scale is too strong for us, even on a limited scale. Antibacterial agents kill bacteria, but why would we wish to do that? Bacteria is an essential component of life, and bereft of them life could not continue on this planet. Bacteria plays a very important function in the body: decomposing dead cells and eliminating them from the body. To destroy them indiscriminately would be foolish. Learn about a healthy raw food diet that will set you on a path toward health without harmful substances and drugs. Find out how raw garlic fits into our food options. 1) S. Eilat, Y. Oestraicher, A. Rabinkov, D. Ohad, D. Mirelman, A. Battler, M. Eldar and Z. Vered (1995). "Alteration of lipid profile in hyperlipidemic rabbits by allicin, an active constituent of garlic". Coron. Artery Dis. 6 (12): 985–990. PMID 8723021. 2) Gardner CD, Lawson LD, Block E, et al (2007). "Effect of raw garlic vs commercial garlic supplements on plasma lipid concentrations in adults with moderate hypercholesterolemia: a randomized clinical trial". Arch. Intern. Med. 167 (4): 346–53. doi:10.1001/archinte.167.4.346. PMID 17325296. 3) Ankri, S; Mirelman D (1999). "Antimicrobial properties of allicin from garlic". Microbes Infect 2 (2): 125–9. PMID 10594976. 5) Baruchin AM, Sagi A, Yoffe B, Ronen M (November 2001). "Garlic burns". Burns 27 (7): 781–2. doi:10.1016/S0305-4179(01)00039-0. PMID 11600262. http://linkinghub.elsevier.com/retrieve/pii/S0305417901000390. 6) Lawson, LD; Ransom, DK; Hughes, BG (1992). "Inhibition of whole blood platelet-aggregation by compounds in garlic clove extracts and commercial garlic products.". Thrombosis research 65 (2): 141–56. doi:10.1016/0049-3848(92)90234-2. PMID 1579891. 7) Hogg, Jennifer (2002-12-13). "Garlic Supplements" (PDF). Complementary Medicines Summary. UK Medicines Information, National Health Service. http://www.ukmi.nhs.uk/Med_info/documents/GarlicSuppsCMSFinal2.pdf. 8) "Garlic - ''Allium sativum'' [NCCAM Herbs at a Glance]". Nccam.nih.gov. 9) Maulaz AB, Bezerra DC, Michel P, Bogousslavsky J. Effect of discontinuing aspirin therapy on the risk of brain ischemic stroke. Arch Neurol. 2005 Aug;62(8):1217-20. 10) de Moraes Mizurini D, da Costa Maia I, Lucia de Carvalho Sardinha F, de Queiroz Monteiro R, Ortiz-Costa S, das GraÁas Tavares do Carmo M. Venous thrombosis risk: Effects of palm oil and hydrogenated fat diet in rats. Nutrition. 2010 Apr 2. 11) Hornstra G. Influence of dietary fat type on arterial thrombosis tendency. J Nutr Health Aging. 2001;5(3):160-6.